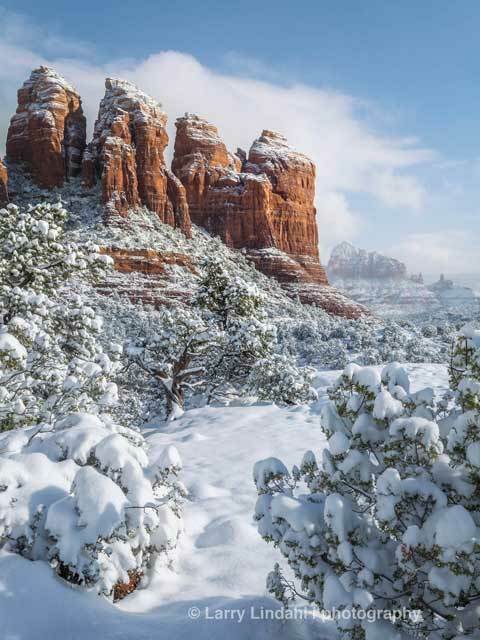 The “first fall of snow” in Sedona was the parting gift of one year and the magical beginning of our new year. The nine-inch blanket of snow transformed our sandstone landscape into a mystical kingdom. Early New Year’s Day, I left behind the pavement and wandered into the wilderness. My boots broke trail, with camera gear and tripod strapped on my back, each step guiding me farther from the hustle of society and closer to the hush of silence. As hours passed, the sky hung heavy with solid cloud cover. Then, as predicted, the storm gradually parted in late-morning. The gray sky opened to patches of inviting blue while the wispy fog lifted upwards. As a seemingly lone adventurer in this open sanctuary of Sedona, only the clarity of birds chirping punctuated the stillness. The quiet of a fresh snowfall is a precious quality in the world, a welcomed peacefulness for my existence. Sunlight slowly entered the frozen landscape illuminating the stark towers of stone cloaked in the purity of white. A new year and a new beginning. For me, the first sacred moment of the new year had been perfectly unveiled. I invite you to view the image full-size.